The brush of a hand, a comfortable silence, the ability to show tears freely. All of this encompasses the idea of the word intimacy, and this is what Jodi Minnis is exploring through the historic, heavy tradition of oil painting. There are certain images that come to mind when we think of oils: grand halls and gilded frames showing mythic men and genteel women. Very rarely, however, do we think of Black faces amidst the magic and trickery of traditional figurative oil paintings, taking the texture of our 3-dimensional world into the 2-dimensional canvas plane - and we certainly do not think of Caribbean ones. Minnis, finishing up her studies in Fine Art at the University of Tampa, is trying her own hand at shifting this narrative for a new show, “Intimacy” opening on August 10th at 6:00pm at the Central Bank of The Bahamas. We managed to catch her for a few words. 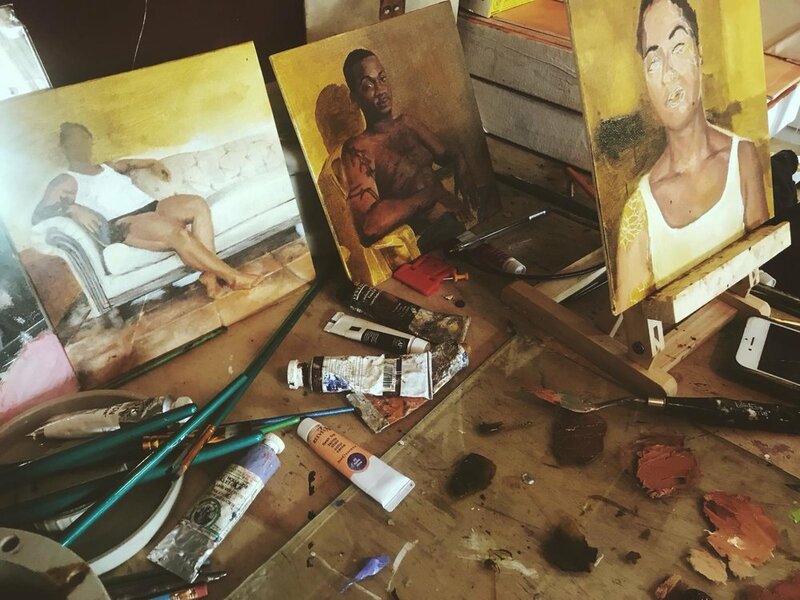 Jodi Minnis’ studio with works in progress for “Intimacy” at the Central Bank of The Bahamas. Natalie Willis: Riffing off of the title, what makes these works “intimate”? Jodi Minnis: I feel as though smaller paintings lead to more intimate and specific engagement. They invoke a sort of delicateness or fragility so I wanted to play on that. All except for one of these photographs and paintings, were taken in the front room of my home. How the people are dressed and positioned in my house makes it intimate. Painting someone in itself is an intimate engagement that I think is sometimes overlooked - you are seeing someone in multiple ways - light, shadow, colour, form and depth and value - and I think that’s an intimate engagement and something that should be considered and not taken lightly. Also, trying to understand how I paint is a very intimate experience with myself- trying to learn myself in this process too makes this intimate. Any moment in time that you look at someone for an extended period of time it crosses that line completely. It’s not impersonal, it’s inherently personal. NW: Why have you chosen to follow the weighted tradition of painting with oils? JM: Many artists we study in Bahamian art history used oils (Brent Malone, Jackson and Stan Burnside, Eddie Minnis), and I’m thinking about how often Black subjects are left out of traditional and historic oil paintings. Understanding that it is very much related to colonial histories, how can I then use this medium to be anti-colonial in a sense? To decolonise its history by disrupting the dominant narrative and including voices so often left out to add to the conversation. I feel as though I don’t know of any Black Bahamian women who use oil painting to render other Black Bahamian women or people. I wanted to use oils to add that particular narrative into the conversation. Artist Jodi Minnis who will be displaying work at the Central Bank of The Bahamas for the opening of her solo-show, “Intimacy”. NW: Where do you place work like this in wider Bahamian art history? For you, whose work does it speak to or what kind of work does it answer to? JM: I don’t think this work speaks to a “who” so much as a “what”. I think this work sits in contrast to works like those shown in “Traversing The Picturesque” because my work shows Bahamians painted by Bahamians, and void of that traditional picturesque, Bahamian, or “Bahamianesque” aesthetic. When I paint a Bahamian woman, she does not have to wear straw hat on her head, be close to the water, be in the street with slippers on and a long skirt. I think the work speaks to people who feel that you cannot truly render your own image as Caribbean people, because that’s the problem too. We should be able to render ourselves as we see ourselves in our lives, and investigate just why it is that we see ourselves that way. Often when we photograph or paint people, we should to be mindful of the gaze we project on each other and why, and how that functions. I want to continue thinking about that and placing work in opposition to the traditional idea of “Bahamian art”. We are so much more complex than that old narrative, and we can exist in more complex ways than that picturesque tropical image. I’m pretty sure I could take these pieces and put them in a gallery in Jamaica, and there would be an affinity to Jamaicanness, or put them in the US and they give a of look of African Americans. Bahamians need to understand that we can exist in those ways, that the Bahamian aesthetic we think we have is more grand and expansive than we give it credit for. I think that’s what this speaks in opposition to - that people studying and investigating works by people who told us who we are. I think this work is telling us who we are. This is not a visiting, temporary outsider painting a Bahamian, or a Bahamian mimicking intentionally a foreign aesthetic. My work shows a Bahamian who exists here, painting my peers, in the most traditional manner possible. NW: Why do you think we find intimacy hard, as Bahamians, Caribbean people and more particular, women? JM: I actually don’t think that we find intimacy hard, but this may be my own personal experience. Caribbean people touch. I don’t know that I’ve met any Caribbean people that didn’t hold your shoulder, or hug, or play-hit you on the arm when they laugh too hard. There are some sort of freeness or connections that we have with other in that way, that we are okay being exposed and vulnerable and that’s a level of intimacy. We have such an expressive culture. We aren’t afraid to laugh, cry, be upset, or angry, whether we know each other or not. Bahamians don’t have those obvious kinds of barriers to intimacy between us like some other cultures. To try to pinpoint, or to try to define what intimacy means for us in our context can be difficult though, I think we have a hard time with that. For example, as a woman it’s hard for me to be intimate with men because we’re always trying to tread that line of thinking of how we will be perceived - of not wanting to give the wrong impression or wrong signals. I also think men have a hard time for their own reasons. Intimacy within friendships can be easy, but the intimacy that comes into romantic relationships is what we generally find really tough. I don’t think we find intimacy itself hard all the time, it’s just hard for us to define and navigate. NW: What is intimacy for you and why is it significant to our lives? JM: Security. It means being secure in presenting yourself to another in whatever fashion - be it romantic or platonic. It’s feeling safe to let your hand bump into someone else’s hand when you’re on the bus together, or feeling safe to enter a quiet space and add to that silence, that you can’t disrupt it. I am a very vulnerable person, I wear everything on my sleeve, my face, and my heart is so open and big, so intimacy to me is being comfortable enough to be that around someone else. If I’m intimate with you, then that will continue in our relationship. If I’m not then what you get from me is a very closed off person, and I think it’s significant because I think that everyone should be able to feel safe with being who they are, and expressing themselves in different ways. It’s a powerful thing, because who wants to live a life being at arm’s length with everyone or distant from everyone? I don’t think that’s a viable life to live. It’s not beneficial to anyone. Jodi Minnis’ solo show “Intimacy” will open on Friday, August 10th, 2018 at 6:00pm at the Central Bank of The Bahamas and run for one week through Friday, August 17th, 2018. The opening night of the exhibition will also feature a short performance artwork, a collaboration with Matthew Rahming, that will begin at 7:00pm sharp.